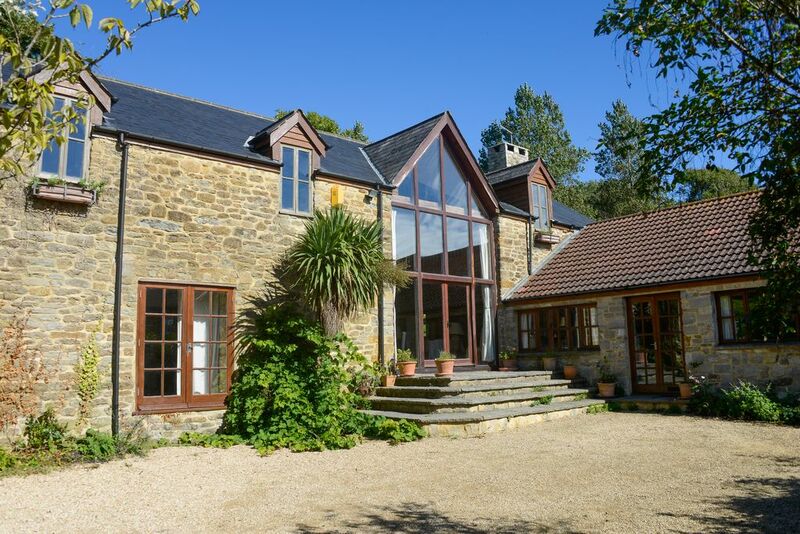 The Barn on the Coast is an 18th Century Barn conversion. It has a large open plan layout boasting huge oak beams, original grain winch, wooden floorboards, open fireplaces and large glazed windows. A detached building located in a farm hamlet on the outskirts of a small village with local pub and seasonal store. The barn has large enclosed garden with pond, gazebo and orchard, backing onto fields. Decorated with a mixture of modern and antique furnishings including roll top bath, grand piano, 6ft pocket sprung bed and electric range cooker. Merv and Vicky are a married couple with two children. They have been renting the Barn for over twelve years, since moving to Bridport in 1995. They also run a bar/restaurant in Bridport called Beach and Barnicott. The barn was bought in 1995 after stopping in Bridport by chance, on route to somewhere else. Merv was drawn to the barn as it was a derelict building on an unused farm and just a stones throw to the sea. The barn required extensive renovation to make it habitable and took over two years to complete. It is in a wonderful location, being in a small, very unspoilt hamlet close to a beautiful stretch of coastline. The area is an area of Outstanding Natural Beauty and has gained World Heritage Status. It is a super location for enjoying the countryside, wildlife and nature. It is also a highly creative place with a large number of local artists and crafts people. It is also well catered for, for food lovers, with a number of highly rated restaurants and gastro pubs. The property benefits from being very spacious and roomy. Being open plan it is ideal for groups and families wishing to enjoy sharing time together. It also provides the opportunity to retreat from others and enjoy the general ambiance of the area. It is in a quiet rural location, but benefits a number of local facilities within walking distance. With large open fires and rambling garden it is an ideal location for both winter retreat and summer frolics. The huge exposed oak beams, large planked wooden floors and great expanse of glass makes it a unique, bright, inspiring environment. Bathroom 1, located on the ground floor (off kitchen) has shower and wc. Bathroom 2, located on ground floor (off bedroom 1&2) has roll top bath, shower and wc. Bathroom 3, en-suite to bedroom 3 has shower and wc. Living room 1, situated on the ground floor has large medieval style open fire-place (with fire guard) surrounded by sofas and chairs. There is a large dining table with seating for 12-14. This room also has access to the garden via French doors. Bridport and West Dorset Clifftop Golf course on Burton Road is situated less that 2 miles from the Barn and affords stunning sea views along the Jurassic coast with Lyme Bay to the West and Portland and the Chesil beach to the East. Notes on accommodation: The barn is centrally heated throughout. In addition there are open fire places and log burning stove. Logs are provided. The barn is suitable for children, young children under supervision. Pets are considered upon request. We charge an extra £20 per dog, with a maximum of two dogs. Outside: The garden is a special feature of this property. It is large (1/2 acre) and natural with lawns that run down to a charming Thai style pergola covered in flowering plants overlooking a delightful pond. There are many shrubs and trees, with a sloping orchard to the top of the garden that affords stunning views across the valley. The garden backs onto a beautiful field with horses. The outside front of the barn provides parking for four cars. Behind the kitchen, there is a level seating area with water feature, garden chairs and table. There is also a BBQ. Utility Room: The utility cupboard is complete with vacuum cleaner, iron and ironing board, clothes drying rack. Cleaning / Towels / Linen / Maid service: All bedlinen, hand towels and tea towels are provided. Bath towels are NOT provided. The property is cleaned prior to each rental. A cleaning service during rental periods can be arranged. We expect rentals to tidy the property prior to departure. Other: Lounge 2 is situated up 1 flight of stairs. This room has log burning stove, sofas and coffee table. Equipped with TV, DVD and video. There is also a music centre with speakers. This area can be screened off with curtains. There are French doors. The Barn is stunning and has everything you could possibly need for a group gathering, and more! Multiple places to relax, dine, and stretch your legs. We loved the well equipped kitchen and the tall-ceilinged barn area! The beach is only a 5 min walk away, and has access direct onto the stunning coastal trails. Thank you to Victoria for having us at your stunning place, we absolutely loved it and would definitely come back! Beautiful house, well equipped, beautiful location! Loved the house and was perfect size for the 12 of us - with plenty of space for the 5 kids to explore...and disappear when required! Also we requested at late notice balloons, banners and flowers for my mothers birthday which the owner provided and did an amazing job and made Mum very happy! Many thanks to Vicky and hope to return again! 'Stunning' is the right word for this barn. We loved everything about it - from the comfortably furnished bedrooms, to the large shared spaces, to the pint of milk left thoughtfully in the fridge for our arrival. The well equipped kitchen made catering easy, and the local pub was very welcoming when we descended on them for dinner. The gardens are lovely and the pergola by the pond was the perfect place to sit peacefully and listen to all the birds chirping. Absolutely beautiful house, had a lovely time. Agree with some of the other reviewers that two rooms are quite small and the shower in the master bedroom could do with updating. I would not say it’s large enough for 12 adults, but perfect for 10. Fantastic area, and the local pub was very friendly. Property was in really good condition, lovely and spacious. Perfect for a group of 12. Loved it and would go back. The Barn is located just 10 mins walk to the beach. This is a stone and shingle beach shifting to sand depending on tides. It is part of the World heritage Jurassic coast and is renowned among fossil hunters the world over. The beach has wonderful coastal walks and is also good for swimming. The nearest airports to the Barn are Exeter and Bournemouth International airport. Both of these are approx. 1 hours drive away. Weymouth ferry port is approx 30 mins drive away. Portsmouth is approx. 2 hrs drive. The Barn is located in the village of Eype approx 1.5miles from Bridport. The idyllic and historic town of Lyme Regis is approx. 12 miles away, as is the quaint thatched village of Abbotsury and the world renowned Chesil Beach. We are surrounded by a number of Iron Age hill forts most notably Maiden Castle just outside Dorchester approx. 15 miles away. River Cottage HQ is a stones throw away on the outskirts of Axminster. Charmouth Beach well known for its fossils is just 5 miles away. The village of Eype is equipped with local pub, church (doubling as Centre for the Arts) and seasonal shop. Bridport, just 5 mins drive away has a good range of independent and high street shops. For dining we recommend Beach and Barnicott, The Montien Tahi, The Half Moon at Melplash and the Ilchester Arms in Symmondsbury. There is the usual selction of High Street banks and a Waitrose, Morrisons, Co-op and Lidl in Bridport. Tescos and Waitrose offer a home delivery service. Booking Notes: Following a telephone or email enquiry, we require a £200 deposit and completed booking form to secure a booking. Booking forms can be found on our website www.barnonthecost.co.uk under Prices and Contacts. Full payments are required approx 6 weeks before visit and can be paid by cheque of bank transfer. Deposits are returned approx. 1 week after visits. Changeover Day: We generally rent the barn for weekends and week rentals. Weekends run from Friday pm-Sunday eve or Monday eve. Week long rentals run from Friday pm to Friday am. Special rates are available for mid-week bookings, please ring or e-mail for details. Notes on prices: The Barn is available for weekend bookings out of school holidays. A weekend costs £1150 from Friday to Sunday. We charge an extra £150 for an extra night. We offer great deals on mid-week breaks, particularly during the winter. Please ring or email for details.